FIGS! One of those fruits and vegetables that have a brief moment in time as the limelight of a season. Figs are included in that group of “now you see them, now you don’t” fruits. The time is now to find figs in the market, and I had one more little basket left to use from my shopping. Plus it’s still perfect time for us to make ‘grilled’ pizzas with a focus on those sweet blue-skinned gems. What came to mind? Grilled Prosciutto, Fig, and Marinated Mozzarella Pizza! Fig trees produce twice a year, of which one is this present moment. Yet in some places, it’s a real truffle-hunt to find them (my little town for instance). To find the fig treasure I had to drive 50 miles to Whole Foods to nab up a few baskets and have my ‘eureka’ moment’. Our acreage is miles away from any market that offers non-everyday foods. Upon my discovery, I dove in with an over-expression of delight and enthusiasm. No, not at all ! Grilling outside is still the norm this time of year here, especially if you’re into tail-gaiting at football games! Grilling this pizza with the interplay of seasonally fresh figs with their jammy sweetness and prosciutto’s saltiness is a perfect excuse to spend the warm afternoons and cooler evenings outside in Southern Septembers. Add in the tangy, creamy marinated mozzarella cheese and a drizzle of balsamic vinegar and the results will send your tastebuds into Italian nirvana! One of the best things you can grill is pizza! And all because pizza benefits from a real fire and your grill is hotter from an actual fire than your oven. and antipasto bar at Whole Foods or Fresh Market. they REALLY make a huge difference in taste and texture! and as promised, a simple sausage and cheese grilled pizza for my husband! Grilled pizza is one of the easiest and delicious ways to enjoy pizza. Great fun for the family and friends to add toppings on their own personalized pizzas! 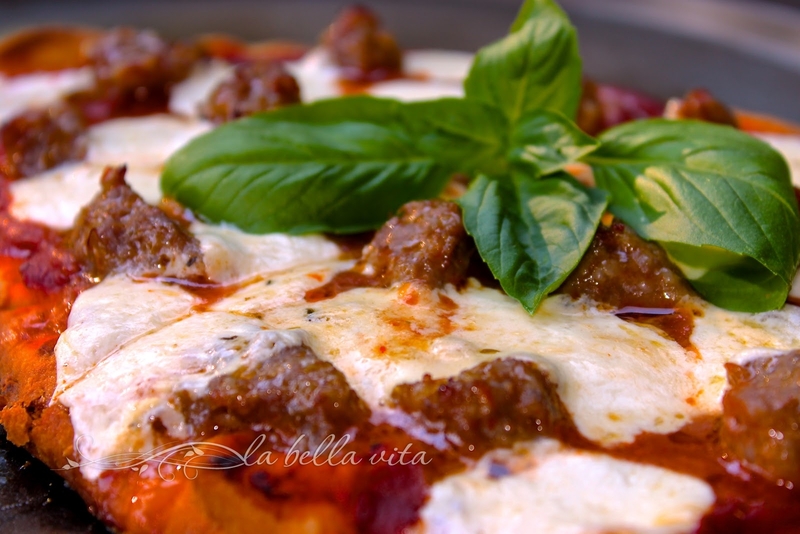 Wonderful tips for successfully grilling pizza are provided at the end of the blog post. Mangia! If in a hurry, use “Naan” bread for individual pizzas. Prepare pizza dough according to directions. Let set overnight in the refrigerator. Mix the minced garlic with the olive oil. Spread generously on the pizza dough (blend more garlic and olive oil if you need more for larger or multiple pizzas). Next generously spread on the pizza sauce. Layer on the prosciutto strips. Scatter sliced figs on top. Grill on a medium-hot grill until cheese is ooey, gooey melted all over! Keep a close eye on the grill because the dough may burn. If you have a pizza stone, have it pre-heated on the grill and USE IT to prevent the dough from burning. If you see that the dough is burning and the cheese is not quite as melted as much as you prefer, then just finish it off for 5 minutes in a very hot oven. Serve with olive oil and balsamic vinegar to drizzle on the pizza. 1. Make sure your grill is hot enough, in fact, your grill should be incredibly hot. If it’s not hot enough, the pizza dough won’t crisp up nice and firm. A good rule of thumb is to allow a charcoal grill to heat up for at least 30 minutes before grilling whereas a gas grill only needs 15 minutes. 2. Both types of grills should reach a heat level of at least 550 degrees F. To test the grill’s heat, hold your palm about 4 inches above the grill grate and count how many “Mississippi’s” it takes before you need to pull your hand away. If you can count 5 “Mississippi’s,” then you’re good to go. Put the pizza pie (no toppings) onto the direct heat side of the grill, leaving the grill lid off. Grill dough for 3 minutes. Next flip the pizza, put the toppings on, and move the pizza over the indirect heat side. Place the grill lid on and let the pizza cook for another 3-5 minutes, or until the toppings are hot and melted. 4. Set up a workspace near your grill to place all of the toppings and sauces you’ll put on your pizzas. Moving fast due to the grill’s high heat is critical, so make sure that everything is within arm’s reach of the grill. 5. Prepare all your ingredients ahead of time and place them on your workspace next to the grill. 6. Have the right grill tools at your side on your workspace area – Grilling Tongs and a spatula will be your best friend when you’re grilling pizza. You can also grill your pizza on a pizza stone if the recipe calls for it. 7. Use smaller rounds of dough instead of one larger balls of dough. 8. Roll the dough out to about 1/4″ thick minimum. However, a little bit thicker dough makes it easier to handle. When rolling out the dough, make sure that it is an even thickness to prevent thick areas of dough that won’t cook through completely. Use a rolling pin if you need to. 9. Once the pizza dough is rolled out, brush on some olive oil which helps prevent scorching the crust and from sticking to the grill grates while grilling. 10. Naan bread, as used in this recipe, is a great substitute for those too busy to make pizza dough from scratch. Some grocery stores carry fresh pizza dough also. Do you have any great tips to share for grilling pizza, either on a charcoal or gas grill? Note: This post may contain affiliate links; view my Disclosure Policy for details. We earn a small percentage from any purchase you make by clicking on these links at no extra cost to you. Oh, that looks just divine! Salty, sweet, so much going for it. A must have in my book. You’re right Rosemary, the sweet and the salty together are so amazing! Thanks Rosemary! I totally agree and will make this over and over again! I would have never thought to a pizza with fig. This receipt is fantastic!!! I think I will try this pizza. Thanks for stopping by! 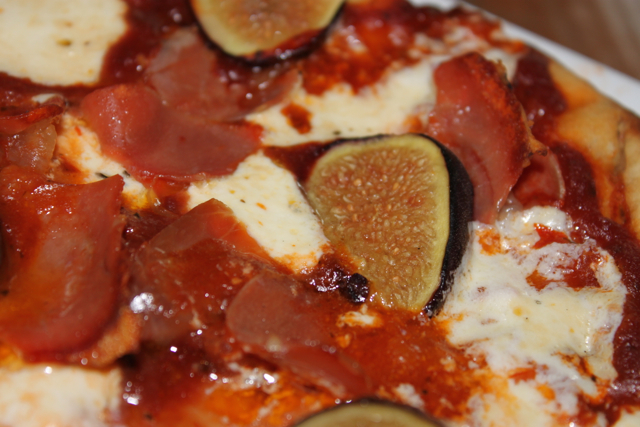 I hope that when you have fresh figs that you will try this pizza too! Oh Roz, I’m baking focaccia with prosciutto and fighi for my blog… Pizza and fighi is so Italian! 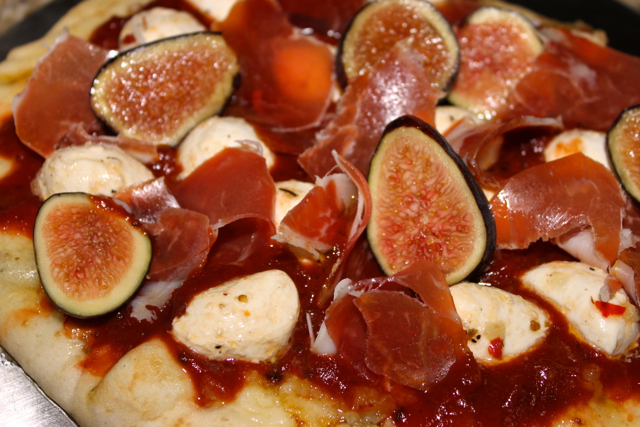 But I never tried figs on top of pizza with tomato sauce…good tip! 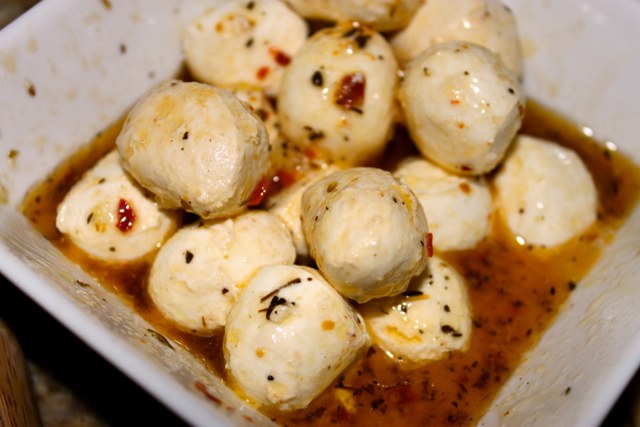 PS I love your pictures very inspiring and the mozzarella balls (bocconcini), beautiful. Rita, I just visited your blog and saw your beautiful fig and prosciutto foccacia recipe. I printed it off . . . it will make such a wonderful lunch sandwich or panino! Oh My Goodness, Roz – this is making my stomach growl, it looks so incredible! Just lovely!!! Thanks Carol! My tummy growls for your recipes too! Roz, this looks freaking delicious! Figs are the bomb Angie . . . your stuffed figs recipe is just the BEST too! You definitely put those well-sought after figs to good use! Those pizzas look amazing! Dear Joanne, thank you for your kind comment! I will keep you and your family in my prayers! We LOVE you! Oh, I needed this three weeks ago when I picked up two big baskets of figs at the market! Pam, don’t you just wish the fig season lasted a wee bit longer? I mean come on, let’s have some more time to enjoy these things! I have never seen figs on a pizza but it might be interesting to try. If you have fresh figs still in Italy, do try this LInda. It’s yummy! Wow, this looks incredible, Roz. Bill would be requested a sausage pizza, too…they don’t know what they’re missing!!! Liz, I think we are married to clones! Aren’t you the sweet wife for cooking up that separate pizza for your husband? Too bad he’s not a fig pizza lover – he’s missing out on good stuff. LOL Linda! Gotta keep the meat and potatoes man happy too! You’re right though, he missed out! One of my goals in life is to eat a fig picked fresh from a tree somewhere in the world. I have never been anywhere during the season, so that needs to change! As for the pizza and grilling, we need to hold on to summer as long as possible. Val, I sure hope you reach that delicious goal! You’ll love them! hey my friend! I swear I will get to your email tonight! So glad I get to guest post for you! This pizza is incredible. i can’t ever think of a more genius creative pizza i have seen. 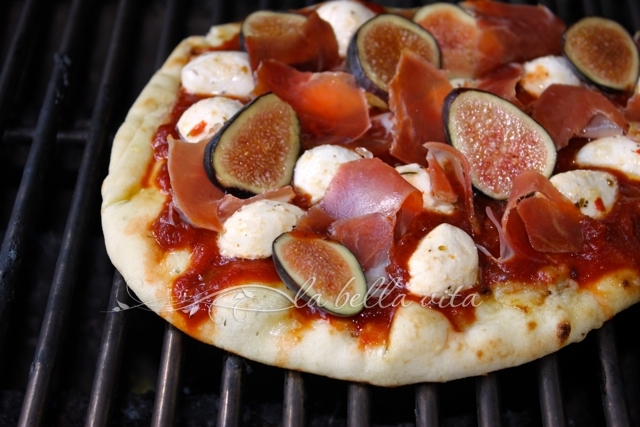 Love the flavors of fig and prosciutto together much less on a nice grilled piece of pizza dough! WOW! I am SO Jazzed that you’ll be one of my first guest posters! You post will be super-fantastic without a doubt! I can just imagine how tasty that must be! Thanks Helene, I hope that you can try it someday. YUM! wow this looks really nice such a nice pizza with so many fruits and sauce which looks very delicious and tasty thanks for sharing this with us…. Thank you Ron! Nice to have you stop by for a visit! It’s definitely not time to bundle up here either. 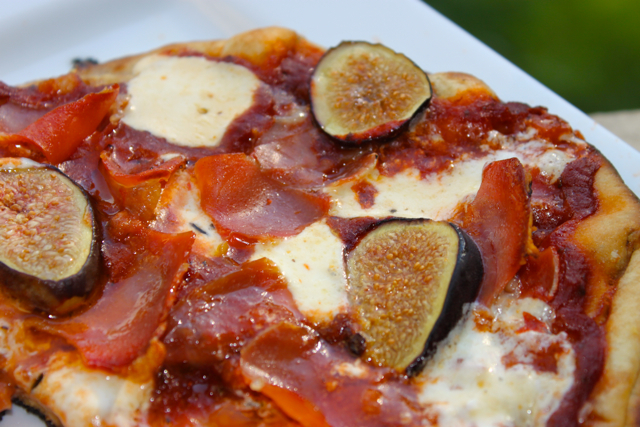 Grilling a pizza sounds perfect for our “fall.” The figs with a drizzle of balsamic sound delicious! Goodness, it was 87 degrees today and guess what Lisa? We’re grilling outside again! That’s normal here in the South! These pizzas look wonderful. I agree that figs come and go so fast it’s hard to believe the season lasts one weekend at our grocery store. By the time I saw the figs, the only ones left were not fit to eat 🙁 Oh well – guess I’ll just drool over your fantastic pizza(s). Yum! Isn’t that the sad truth about figs Tricia! Too short of time in availability! I love that lava cake that you just posted! 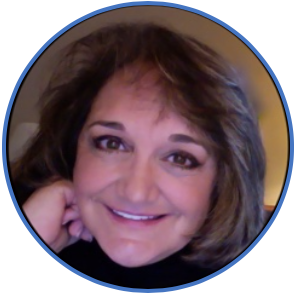 I would love to share with you if you were close by Catherine! I always love your visits! Truly unique and quite tasty looking. Roz I love figs this is a great change of pace! AWESOME idea and looks delicious! Thanks Claudia . . . so many delicious recipes, so little time! My husband would LOVE this pizza, Roz! He adores figs and is sad we have to leave our fig tree behind when we move. We will try to grow another one in Colorado but I fear the weather will be too dry and the winters too harsh for it. Time will tell! Pat, when you move to Colorado, you’ll be like me and have to search for them in the fresh markets. I’m sure Colorado will have wonderful fresh markets!!! Then you can make this pizza for both your husband and you! I have a fleeting seasonal relationship with figs. I have a big tree in my backyard. The figs ripen at the same time. I am always scurrying for something delicious. Figs and proscuitto are like a hand in glove. if you want to take it the next level just a bit of blue cheese too. Your pizza rocks! Love it. Velva, I almost added blue cheese or gorgonzola but I just used it in my salad in the post before. But you’re right . . . it’s a perfect marriage with figs and prosciutto! You’d love it Rebecca! Congrats on your tv show appearance! You’re FORTUNATE Mary to still be able to find them. Maybe a few more weeks of availability here. I hope you have a great weekend too!